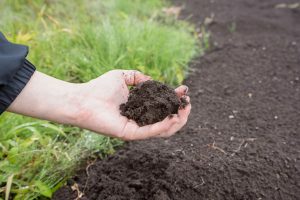 Does your lawn need a soil test? If you’ve noticed problems with grass color, density, or rooting, the answer is yes. Having a soil test done is the right first step to take to correct these problems. Grass needs at least 18 different nutrients or essential elements to grow luxuriously. Of these, nitrogen, phosphorus, potassium, calcium, magnesium, and sulfur are needed in relatively large amounts. Most fertilizers supply nitrogen, potassium, and phosphorus. Which ones does your lawn require? Dumping fertilizer on your grass won’t solve specific problems if you don’t know what the soil is missing. This is what a soil test determines. Soil tests also detect issues with soil pH. Soil pH has an enormous effect on plants because the pH level of the soil affects which nutrients are made available to them. If the plants in your landscaping are not thriving, pH could be the reason. Soil that is too alkaline or acidic must be corrected for them to bloom and grow. Soil testing can be done any time of the year and should be done on a periodic basis to make sure your lawn always has what it needs. Call Bykerk at (616) 698-7263 to schedule your soil test today.